5.Super connection,massive application,support phones,computers,digital cameras,laptops etc. 【Big Screen】Image size 35-120 Inches.Share Wonderful moved moments with your friends, partner, family and your dear guests.We suggest best Projection Distance: 5-7 feet; best Projection Size: 49 to 80 inches, which can make you obtain best User Experience. 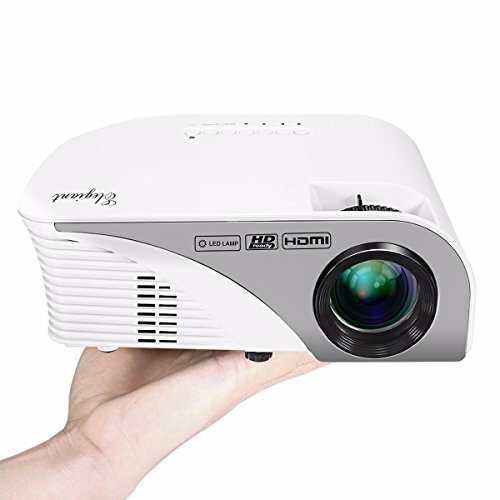 【Rich Interfaces】 With rich interfaces, AV/VGA/SD/USB/High Definition Multimedia Interface slots make it possible to easily connect a desktop, notebook, tablet, DVD, WII, XBOX, MP5, digital camera to this projector. 【High Configuration】Native Resolution:800x480RGB;Supported resolution:1920*1080, Brightness:1200 Lumens,Aspect Ratio: 4:3/16:9,Contrast Ratio: 1500:1, ideal for home theater movies and video game use. Can provide crystal clear image in dark environment. 【Long Lifetime】The LED lamp works for about over 50,000 hours, provide a super clear picture.Usually, when the projectors work, the fan will make noise to Radiating due to the high temperature. It will be better than you can have a break after 3 to 4 hours using to avoid overheating. 【Portable Design】Unit Size(L*W*H):8.7*6*3.5 inches, which is nearly the same size as your mini iPad. Easy to take and travel, just enjoying watching movie at home and outside for camping.